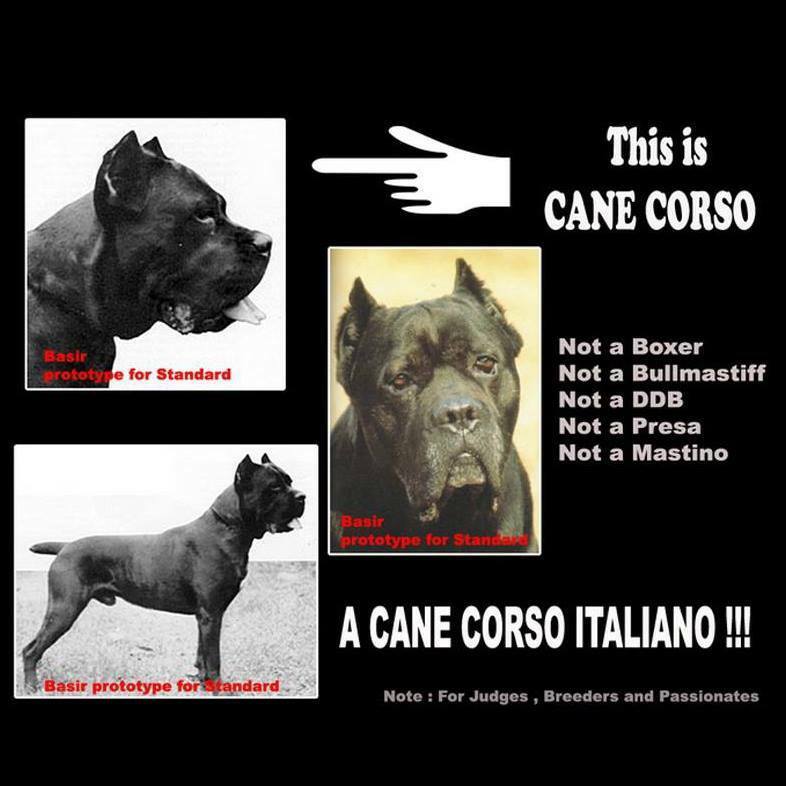 The Cane Corso is the direct descendant of the ancient Roman molosser dogs. In the past, the breed was common throughout Italy, but is now found in the provinces of Foggia and Bari. This name derives from the Latin “cohors”, which means “protector, guardian of the farms, courtyards and enclosed property. The breed first appeared in the sixteenth century and was used for hunting and guard duties. Medium to large sized dog. Robust and sturdy, nevertheless elegant. Lean, with powerful long muscles. Guardian of property, family and livestock; extremely agile and responsive. In the past, it has been used for herding cattle and hunting big game. Height at the withers,Males from 24 to 27 inches (62 to 68 cm) and Females from 23 to 25 inches (58 to 64 cm). Tolerance of inch (2 cm) more or less. Males from 92.6 to 110.2 lbs (42 to 50 kg) and Females 83.8 to 99.2 lbs (38 to 45 kg). The length of the head reaches 36% of the height at withers. The dog is somewhat longer than high. Coat: short (not smooth), shiny, very thick with a light undercoat. Color: black, lead grey, slate, light fawn (yellowish), stag red, brindle; black mask is present in fawn colored dogs. Large and typically molossoid. The upper longitudinal axes of the skull and muzzle converge slightly. Skull: wide; at the zygomatic arch its width is equal to or greater than its length. Convex in front, it becomes fairly flat behind the forehead as far as the occiput. The medio-fontal furrow is visible. Stop: marked. Nose: black and large with ample, open nostrils on the same line as the nasal bridge. Muzzle: noticeably shorter than the skull (ratio : skull 62%-64%, muzzle 36-38%), strong, extremely square, with a flat front face and parallel nearly as wide as long lateral surfaces. The profile of the nasal bridge is rectilinear. Lips: the upper lips hang moderately and cover the mandible, so that the lower profile of the muzzle is determined by the lips. Jaw/Teeth: jaw very large, thick and curved. Lightly undershot. Level and scissors bite acceptable. Eyes: medium-sized, ovoid, looking directly forward, slightly protruding. Eyelids close fitting. Color of the iris as dark as possible, depending from the colour of the coat. Expression keen and attentive. Ears: triangular, drooping, with a large set on high above the zygomtic arch. Almost always cropped in the shape of an equilateral triangle. Strong, fairly thin, muscular, as long as the head. Shoulder: long, oblique, very muscular. Upper arm: strong. Forearm: straight, very strong. Carpal joint and pasterns: elastic. Forefeet: cat feet. The body is somewhat longer than the height at the withers. Sturdily built, but not squat. Withers: pronounced, rising above the level of the croup. Back: rectilinear, very muscular and firm. Loins: short and solid. Croup: long, wide, slightly inclined. Chest: well developed in three dimensions, reaches to the elbow. Upper thigh: long, wide, posteriorly convex. Lower thigh: thin, strong. Hocks: moderately angulated. Metatarsals: thick and narrow. Hind feet: slightly less compact than the forefeet. Set on of the tail fairly high; very thick at the root. The tail is docked at the fourth vertebra. In action carried high, but never curled nor erect. the muzzle and the skull; converging side lines of the muzzle. • Pronounced and disturbing undershot mouth. • Tail: ring-tail, tail in vertical position. • Axes of the muzzle and the skull diverging. • Bridge of nose resolutely hollow, ram's nose. • Eyes: partial and bilateral palpebral depigmentation, wall eye, bilateral strabismus. • Tail: tailless, short tail (artificial or congenital). • Hair: semi-long, smooth, fringed. • Colour: all colours not indicated in the standard; white patches too large.